Here is a brief history of the church. For more details, including a list of pastors from 1800 to the present, get the lastest historical brochure. In 1800, the Reverend John Robinson was called as a teacher and preacher by the Presbyterians in Fayetteville, North Carolina. A native of Cabarrus County, born January 8, 1768, Mr. Robinson came to Fayetteville from his first pastorate in Duplin County. Soon after his arrival, he took the necessary steps to organize a church and on September 6, 1801, the ordinance of the Lord’s Supper was administered for the first time in Fayetteville. About one hundred and fifty sat down to the table; seventeen of these belonged to Fayetteville and others to the surrounding congregations. A tablet hangs in the vestibule to perpetuate the memory of the Reverend John Robinson, D.D. ; his portrait hangs in the Historical Room. As early as 1809, plans were made to erect a church building. The Reverend Colin McIver, stated clerk of the Session, was appointed to make a Northern And Southern excursion to solicit funds. From his “Northern Excursion”, he collected $293.00. Among the contributors to this sum were James Monroe, President of the United States ($25.00), George Washington Campbell, Ambassador to Russia ($10.00), and John Quincy Adams, Secretary of the State ($10.00). His “Southern Excursion” netted $55.00. 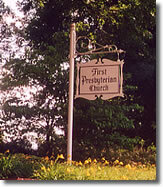 During the pastorate of the Reverend Jesse H. Turner, the cornerstone of the original church was laid, April 21, 1816. This building was used continuously for church services and civic gatherings until the Great Fire of May 29, 1831, destroyed the church and over six hundred homes and businesses in the village. The Society of Young Ladies presented to the church in 1824, a Communion silver service consisting of a bread basket, two cups and a tankard. This service is used in every Communion and may be viewed in the Historical Room. The handsome chandeliers that hang in the vestibule on the first and second floors of the church sanctuary are the original lighting fixtures installed after the Great Fire of 1831. The lamps of the chandeliers burned whale oil. 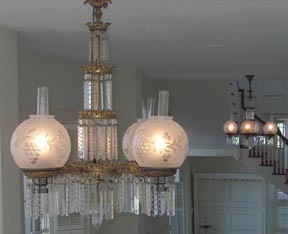 When gas lighting was installed, these chandeliers were removed and sold to Big Rockfish Church. Around 1933 through the efforts of various women of the church, the chandeliers were brought back home and restored to their original beauty and hung, two to a side, within the sanctuary. During the restoration of 1960, they were placed in their present position.